Smart receipt will customize your business. Smart Receipt manages your expenses. It turns your phone into a receipt scanner and expense report generator. Track your receipts and generate data in both PDF and CSV reports. Share the receipt data with your email accounts. It is smart for both individuals as well as businesses. Access your data in the right way. It is built to give you complete control of your data. Find this app on both Android (versions 2.2 and higher) and iOS (versions 7 and above). Before uploading your receipts, first, you need to create report details. Like the name, start date, end date, default currency and comments if necessary. Then upload your receipts either as picture snap or import from gallery/ file or text-only. It also tracks mileage in which you can add distance, rate, currency, rate and so. Backup your data in two ways: manual backup or automatic backup. A white labeling product is a product or service produced by one company, other companies re-brand it. It allows you to customize using white labelling services. You can customize the title, icon, settings, reports and so on, what else you need? The Features of smart receipts enables small businesses, accountants, and cost-minded individuals to track their budgets. Bored of scanning receipts? 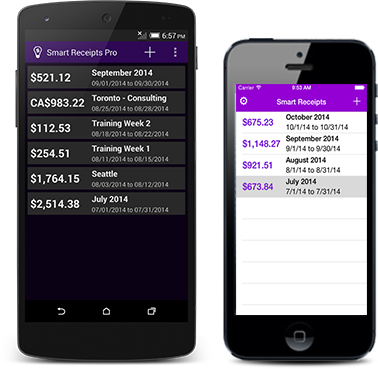 Manage your expenses and generate expense reports using smart receipt. It is built for both efficiency and flexibility. All receipts scans can be done automatically. Provide your own customized app to your customers and users with white labeling. They can upload receipt data quickly and easily. For accountants, who wish to support their own app and other small businesses white labeling is perfect. Enterprises can also use the white labeling service.